Do you have a favorite apple? Have you ever thought of the work and care that goes into the planting, harvesting, and selling of the apples? 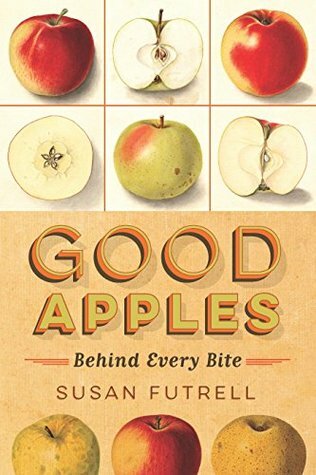 Susan Futrell’s book takes readers through the history of the very first apple tree to the now over 2,500 varieties of apples available to consumers all over the world. Futrell’s background in writing, marketing, sustainable farming and a love for apples combined in a perfect challenge to share the journey of an apple from a seed to a tree to our grocery stores and finally to our tables. Through meticulous research and visiting with apple growers all over the US, Futrell shares the stories of family orchards as well as major corporations providing our apples. There are also those heartbreaking stories of families watching as the trees they planted with love were bulldozed to make room for roads, housing, or other farming land. After reading about the numerous issues that can arise during just one season of apple growing, it’s a wonder to me how we have any apple growers left. Growing apples goes far beyond planting a tree and includes the intricacies of trimming trees and the biology of grafting branches together to create new varieties to meet market demand. There is a whole chapter on the delicate science of managing pests. Many insects have become resistant to chemicals but growers have to be careful to not use too harsh of chemicals that will turn off the anti-pesticide consumer. Of course, no one wants to buy an apple with a bug inside or brown spots, but consumers are also very vocal about the desire to have organic and pesticide-free apples. This makes for a tricky balance for apple growers to keep grocers and their customers happy. As if the difficulty of keeping pests away from the apples weren’t enough, growers are constantly trying to find employees willing to do the hard work during the harvest season. Many of the orchards turn to immigrant workers and this does not come without obstacles, including ever-changing government restrictions. Apple growing has become a multi-faceted business that leaves many growers saying it just isn’t worth it anymore. One of the most interesting pieces of the book happens early on when the author shares her story of nearly buying an orchard at an auction. As I followed along with the auction proceedings, the anxiety built and I had this incredulous feeling of wondering what the author was going to do with an orchard. The orchard is purchased by another family and I breathed a sigh of relief, one not nearly as big as the author or her husband, but what it did show me was the passion and heart the author has for family orchards and sustaining that piece of the food chain. This book will offer readers a new insight into what goes into owning an orchard and appreciating the abundance of apples available at our local grocery stores. It also offers readers a chance to see a connection between supporting local farmers and growers and what it takes for those products to actually appear in our stores and farmer’s markets. I don’t think you will be able to take a bite out of an apple and not wonder about the person who first planted the very seed or grafted that branch that led to the creation of the apple you are eating. I had the privilege of interviewing Susan Futrell for the Cedar Rapids Gazette. This article first appeared there. We met at a local coffee shop and had a lively discussion about apples, our connection to them and how important it is for the younger generation to understand the work that goes into creating the fruit and vegetables we put on our plates. I bet if you were asked, you could either tell me your favorite apple, a story about having an apple tree in your backyard, or about a visit to an apple orchard either from your childhood or taking your own children. Apples are the fruit that brings people together either through a pie, applesauce, picking one right off the tree, or knowing the importance of eating “an apple a day to keep the doctor away”. 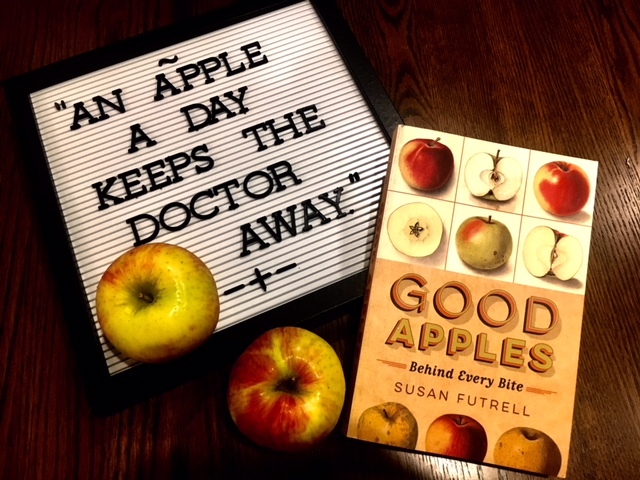 Susan Futrell’s own connection to apples began during her childhood. As the oldest of four children, she was raised to know where food came from with a large garden and fruit trees in her backyard. Her father worked for the extension service as an agricultural economist, so it was important to him that his family knew where their food came from and understood the people that grew the food they ate. The author and I talked about the closing of many small orchards due to financial reasons, family changes, or urban expansion. We shared stories of visiting orchards including Holland’s Orchard, outside of Cedar Rapids, which was closed due to the expansion of Highway 100. We both had wonderful memories of visiting there and reminisced about the delicious apples and kindness of the owners. Futrell remarked that “it is more than just nostalgia, but there is a connection to the land where our food comes from that gets lost when it is no longer in view and in your community.” Futrell nearly purchased an orchard herself because of her passion for keeping local food available and supporting local growers. Thankfully, it was bought by a family who is doing a wonderful job at keeping the orchard going strong. The bulk of the apples purchased in our country is not from local pick-your-own orchards, but through major orchards in the Northeast and Northwest. The local orchards, however, are still an important piece of introducing fruit to young children and for making that personal connection. The apples we are buying in our stores may not be local, but they are still largely coming from family-owned orchards across the country. Futrell isn’t working on a new book yet. She is still working full-time for Red Tomato and writing about apples and the role of citizens in helping support the growers. In October, she will be traveling to Kashmir, India to visit one of the main apple-growing regions of Northern India. It’s a dream trip to interview and learn about traditional and commercial apple growing there. She will learn from them and then she will share about how we market to sellers and consumers here. Susan has always been a reader and when asked, she was excited to tell me about her recent reads. Interestingly, they both had Iowa connections. She just started SOME LUCK by Iowa author Jane Smiley the first in a trilogy about several generations of an Iowa family. She just finished THE BOYS IN THE BUNKHOUSE by Dan Barry about the disabled men living in the house in Atalissa, Iowa. Futrell states she usually reads a mix of good nonfiction, mysteries, and novels. 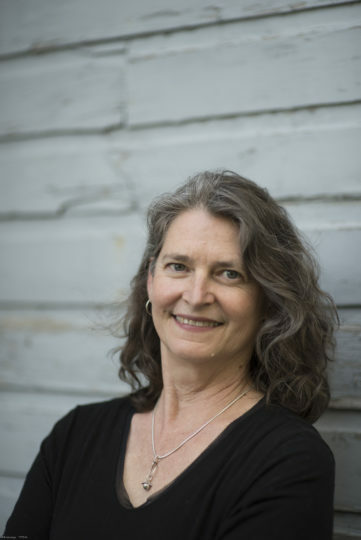 For more on Susan Futrell, please visit her website, HERE. We live near the mountains of North Carolina – an area known for its apples – and many people around here go there to visit apple orchards so this book interest me. I think the cover is just lovely so the book calls out to me. Kathy, then you would really like this book. Even though the author is from Iowa, she talks about all areas of the country and world that grows apples. It is quite an interesting read!